Have some kids on your shopping list that you just don't know what to do for? This is the perfect gift for that! It's silly and fun and can be customized however much you would like! All you need is a roll of cellophane (I bought the cheap Target brand) and an assortment of small toys and treats. Check the party aisle or the dollar spots! I also bought a small gift card! Gather all your goodies and start assembling your ball! I started with the gift card, wrapping it with the end of the cellophane and like you're wrapping a ball of yarn, wrap the cellophane. Tuck the gifts here and there as you go, wrapping and wrapping and wrapping, changing your directions constantly to try to get a ball shape. The ball will form more and more as you go along. Tie it up with some string to secure it and add a tag! 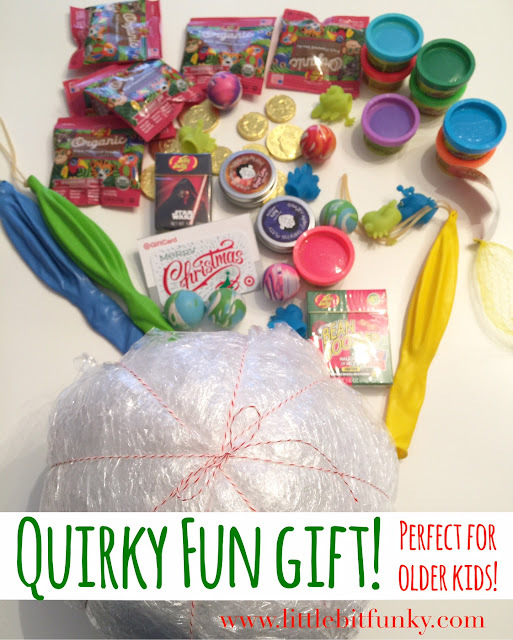 The result is layers and layers of fun little gifts! A silly way to make a small gift more fun! :) Hope you have fun making one!